(There is also a fourth session at the end of each day for questions & answers where people can ask me anything that is on their minds). 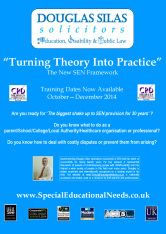 I am afraid that I have already been asked to go around the country this Autumn to a number of organisations and a number of individuals have already signed up to come on my courses so, if this is something that you wish to arrange for your organisation or to attend yourself, then please call my offices as soon as possible to book something/your place on 020 8349 7700 or email me directly. You can download a flyer by clicking on the picture above.